From October 23 to November 15 of this year, I embarked on a whirlwind journey that brought me to Lima, Peru; Cordoba, Argentina; Sao Paulo and Rio de Janeiro, Brazil; Mexico City, Mexico; and Bogota, Colombia. I returned to San Francisco for two days, at which point I returned to Lima, Peru for three days to join the Global Entrepreneurship Week celebrations organized by Prof. Karen Weinberger Villarán, Director of Emprende UP and her team at Universidad del Pacifico, one of the leading business schools of Peru. 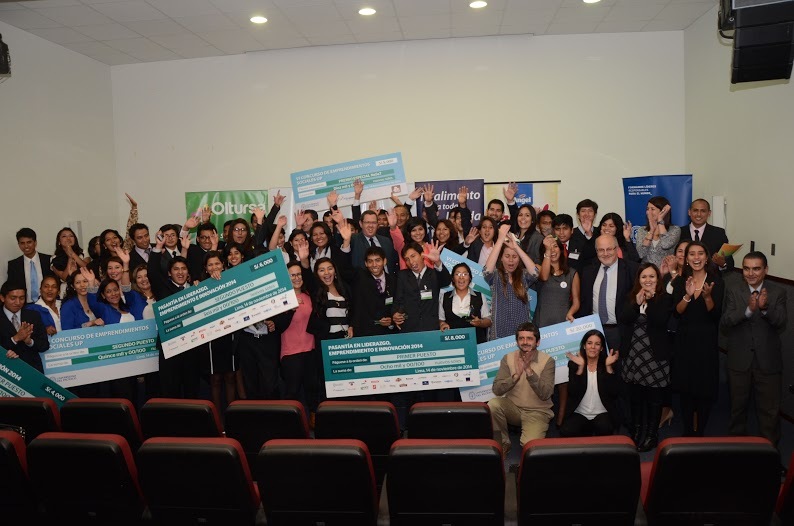 Global Entrepreneurship Week closing ceremony at Universidad del Pacifico, 11/14/2014. 1. Most Latin American entrepreneurs have a tendency to think small. Their target market is their city or at most their immediate region. I’m unsure if this small thinking is due to their desire to remain in their comfort zones or if it’s due to their fear of the unknown. Very seldom on this trip did I hear a pitch that positioned a new Latin American-bred venture globally that sought international markets, technology partners or funding sources. Creating a start-up it is a risky and challenging endeavor, which reminds me of a saying from my youth: “The difference between a difficult and an impossible job is that the difficult one takes lots of hard work… The impossible one takes just a bit of additional work!” Since envisioning/developing the new ventures that I met with suggests that Latin American entrepreneurs have embraced the idea of working hard, why not encourage these entrepreneurs to work a bit harder to become global players? The rewards can be enormously higher! 2. Most Latin American entrepreneurs do not “copy,” “plagiarize” or simply attempt to learn from other similar or comparable global ventures. This unwillingness to study the global competitive landscape limits the horizons of their ventures in their immediate locations and is possibly compounded by the discomfort of accessing information in foreign languages (English being the dominant one). Very seldom did I come across a competitive analysis, benchmarking or stakeholder studies that included global players. Launching a start-up is not a classroom exercise, where budding entrepreneurs are penalized by plagiarizing, imitating or copying someone else’s work. While we must respect the trade secrets and intellectual property of our competitors, everything that is in the public domain is fair game. Hence, we must leverage, learn, avoid similar mistakes and be ready to explain how we will succeed where others have failed, or improve in our go-to-market strategy, pricing, internal processes or internal culture. Doing so can save months and/or hundreds of thousands of dollars. 3. Most Latin American entrepreneurs do not sufficiently leverage technology. Many pitches I heard were timid in the technologies that their start-ups used and simply started with a multi-lingual web site, an e-commerce platform, and a strong digital/social media presence. Furthermore, there are hosts of technology tools to increase the internal productivity of the team as well as those optimized to enhance the customer experience. Technology is one of the great value creation points of leverage for new Latin American ventures. We must embrace its use and be aware of the constant disruptions it potentially brings to all human activities. It is in fact one of the greatest insurance policies for our venture to remain current and viable over time. Developing your own Intellectual Property (IP) and protecting this IP is an essential element of a Latin American entrepreneur’s value creation journey! 4. Most Latin American entrepreneurs fail to recognize that they cannot go at it alone. They are neither heroes nor saints willing to endure extraordinary sacrificies. Instead, Latin American entrepreneurs are bright, hard-working human beings that need ALL the help they can get. Therefore, it is essential that they share their vision with other like-minded individuals they trust, form coalitions and a broad network of supporters, and tap hard into their respective ecosystems. It is also important that these entrepreneurs align all the tangible and intangible resources they can get during the bootstrapping period. Latin American entrepreneurs must recognize that is unlikely that someone will fund their PowerPoint (even in Silicon Valley is hard to get a PPT funded and Latin America is NOT Silicon Valley… yet! ); investors funds teams (not individuals) and compelling solutions to large market pains. Therefore, Latin American entrepreneurs should get their pilot MVPs (minimum viable products) into the hands of their customers fast, get their feedback to their respective teams and iterate quickly until they get it right! 5. Most Latin American entrepreneurs are great “small” salespersons. They have developed great visions, identified compelling value propositions, built great teams, and demonstrated stratospheric levels of energy, passion, and commitment. All this is wonderful, but is of limited value if nobody knows it. Latin American entrepreneurs must be the “salespersons-in-chief” of themselves and their ventures. They need to be almost obnoxious in their persistence. They cannot miss a future client, employee, investor, partner because these people are unaware of who they are and/or what they do! The world is their audience and entrepreneurs only have one shot to make a first great impression! I finished my whirlwind trip with the conviction that the democratization process is well underway that is decreasing barriers to entry and enabling more Latin entrepreneurs than ever before to participate in the innovation revolution. This is irreversible. Governments across Latin America are slowly “getting it.” Unfortunately, often they want to “control” the process and apply the wrong metrics to a journey that is inherently chaotic, unmanageable and long term. These governments would be well served to focus on enabling policies, levelling the playing field, establishing the right incentives and simply getting out of the way… leaving the rest to Schumpeter’s creative destruction, Darwin’s survival of the fittest and Smith’s invisible hand! 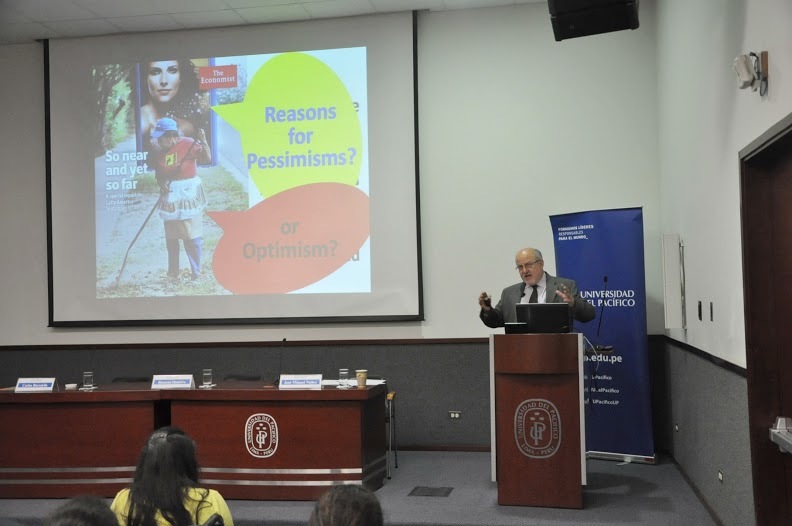 Carlos Baradello during a keynote: Is Entrepreneurship a source of hope for a more equitable and sustainable development in Latin America? I am glad to be back writing after a one-year “sabbatical.” I hope to be back more frequently with my thoughts and continue the conversation with you my dear readers.